You know what I love about Chinese New Year starting Feb 4, it feels like a more productive time to start my new year resolutions. January always has a holidayish, relaxed feeling, even if I’m not on holidays officially. There’s hardly any traffic on the roads ’cause people are away, and alot of shops and businesses are still closed. There seems to be alot more space ‘energetically’ to get clear on what it is you really want moving forward in 2019. January gives me the time and space to relax , re-access, and remove old stuff that’s weighing me down, before I jump back into motivation mode. So don’t beat yourself up if you haven’t started your goals yet, Chinese New Year is the perfect time to start afresh and get your mojo back. To find out how the Year of the Pig will affect you personally, visit my Chinese Astrology – Four Pillars Calculator to calculate your four pillars for free. Remember, the Chinese New Year energies begin February 4. If you have a Snake in your four pillars, the Pig year clashes into your chart stimulating restlessness, a need for change (new job, new relationship, new home), the desire to travel. Take your time over important decisions and slow down as accidents can occur in haste. Wear or carry a Tiger pendant as protection. If you have a Tiger, Rabbit or Goat in your Four Pillars, 2019 is considered a good year for you. If you are born in the Year of the Pig you are said to be ‘offending the Grand Duke’, so take care when doing anything risky in 2019 (and make sure you have insurance). Wear or carry a Tiger pendant as protection. If you have Yang Fire or Yin Fire in the Heavenly Stem of your year or day pillar, your Nobleman appears this year. A Nobleman brings strong support and help in 2019. If you would like a detailed analysis of your Chinese Four Pillars of Destiny, I’m a qualified Chinese Astrologer and can be contacted on 0434 880 411. Dalai Llhama, Elton John, Hilary Clinton, Elon Musk, Chris Hemsworth, Mariah Carey, Emma Thompson. 2019 is a 3 year. 3 is a very social, communicative number. Great for teaching, learning, marketing, computers, communication, media and event planning. Think of Mercury and Gemini energy. Parties and all types of entertainment will feature too. It’s important each year to tap into and enhance the positive annual feng shui energies, and weaken the challenging or negative annual feng shui energies, thereby balancing and harmonising the energy of your home and life. The two numbers which are the most problematic each year are 5 and 2, and must be remedied. If your main door faces West, you can do well 2019 if you work hard and make wise decisions. Hang metal bells on your main door or chime a singing bowl or bell 6-7 times once a week near your main door. If your bedroom is in the West section of your home, your relationships and particularly your health may be good if you look after both. Chime a singing bowl or bell 6-7 times once a week in your bedroom. Every time you chime, say a positive affirmation such as ‘I have perfect health and relationships‘. Remember, what you think about is what you create. If the main door to your home or business is facing North East, you may be financially worse off in 2019 with health issues causing problems. Hang metal bells on your main door or chime a singing bowl or bell 6-7 times once a week near your main door to weaken this challenging energy. Say a positive wealth affirmation when you chime such as ‘I am a magnet for money‘. What you think about is what you create. If your bedroom is located in the North East section of your home, your relationships will be less harmonious and your health and sleep may be worse. Chime a singing bowl or bell 6-7 times once a week in your bedroom to weaken this challenging energy. Every time you chime, say a positive affirmation such as ‘I have perfect health and relationships‘. If the main door to your home or business is facing South, you may be financially worse off in 2019 with arguments, conflicts and legal issues causing problems. The Earth and Fire elements weaken this challenging energy. Place crystals or red/purple/pink objects (pots, pictures, rugs, throws) near your front door. If your bedroom is located in the South section of your home, your relationships will be less harmonious and your health may weaken. Place rose quartz crystals or a red/purple/pink objects (pots, pictures, rugs, throws) in your bedroom to weaken this challenging energy. If the main door to your business is facing North, you may find people have more interest in your products/services. If your home front door faces South you may find you and other family members may have more romantic proposals. The 4 Romance Star also supports academic success and creativity. To support the energies, keep the entrance tidy and visually beautiful. If your bedroom is located in the North section of your home, your health and relationships may improve if you keep the bedroom tidy and attractive. As romantic liaisons are stimulated, you could have problems with competition, particularly if the bedroom is messy and cluttered. If the front door of your home or business is facing South West, the Misfortune Star may negatively impact your life due to accidents, sickness and financial issues. Hang 6 Chinese coins at the entrance to your home or office this year. Every time you look at the coins, say a positive affirmation such as ‘I am a magnet for money’. I also recommend placing metal statues, pots or wall art near the front door but don’t over clutter. If your bedroom is located in the South West section of your home, your health and relationships may be very challenging this year. Be careful of accidents and sickness – slow down, look after your health. The sound of metal neutralises the Misfortune Star, so I recommend a Tibetan Tingsha, Tibetan Bell, Singing Bowl or Brass Bells, which must be chimed once a week. Say an affirmation in the bedroom such as ‘I have perfect health and relationships’ every time you chime. If the front door of your home or business is facing East, power, fame and authority are stimulated. To bring out the positive energies of this star – good relations with authority such as your boss, police, councils etc. you must keep this area tidy and visually beautiful. Remove all clutter. If this area is untidy and looks uninviting, you may stimulate problems with the boss and people in positions of power over you. If your bedroom is located in the East, please ensure your bedroom is neat and visually attractive to bring out the positive qualities of the 6. If the front door of your home or business is facing South East, your finances may deteriorate this year with an increase in fire, accidents and theft. The 7 is bad for business as it stimulates gossip and negative word of mouth advertising. Place 3 or 4 lucky bamboo in a vase at the entrance to help diminish the negative energy. At least once a day, say a positive affirmation such as ‘money comes easily and frequently’ at the entrance. If your bedroom is located in the South East section of your home, your health and relationships may be worse in 2019. Ensure you have a fire alarm in the bedroom, check all smoke alarm batteries and turn off all electrical items at night including electric blankets. 3 or 4 lucky bamboo stalks in your bedroom will help to diminish the negative energies located here. Remember to say a positive affirmation such as ‘I have perfect health and relationships’. Congratulations! If your townhouse, villa, apartment or shop is located in the centre of a block, your finances will be great in 2019. If your bedroom is located in the centre of your home, your health and relationships will be very good this year. Place a red/pink/purple rug, throw, tablecloth or picture in your bedroom to support this positive energy. Congratulations! If the front door of your home or business is facing North West, your finances and/or business will improve this year. Place a large red picture or rug at the entrance to your home or business. Make sure this entrance is used all the time this year as activity helps stimulate this fortunate energy. If your bedroom is located in the North West section of your home, your health and relationships will improve this year. Buy a lovely red rug, throw or picture and put it in your bedroom this year. The Grand Duke is tricky energy that doesn’t like to be disturbed and changes location every year. The Grand Duke resides North/North West in 2019, specifically between 316 – 345 degrees. Try to avoid or minimize construction and digging here. If it is unavoidable, you may experience delays, equipment breakdowns and unforeseen obstacles. 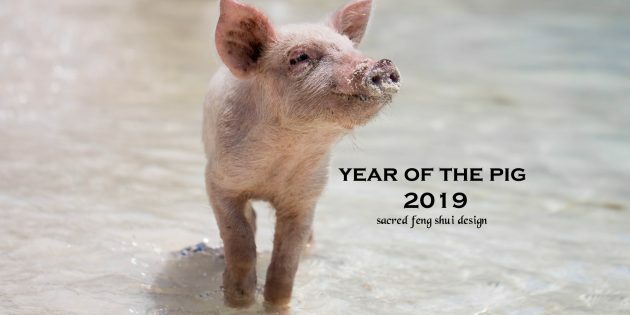 The Chinese New Year of the Yin Earth Pig begins on February 4, 2019 – so February 4 is when the Astrological New Year and the Feng Shui New Year begins. The Solar New Year is based on the Hsia calendar or Solar Calendar beginning February 4, and the Chinese New Year celebrations are based on the Lunar Calendar. The Chinese acknowledge the yin and yang energies of each year; the yang (solar, masculine) new year, and celebrate the yin (lunar, feminine) new year.